The leech has a single row of eight "enormous teeth"
A new species of leech, discovered by an international team of scientists, has a preference for living up noses. Researchers say the leech can enter the body orifices of people and animals to attach itself to mucous membranes. They have called the new blood-sucking species Tyrannobdella rex which means tyrant leech king. The creature was first discovered in 2007 in Peru when a specimen was plucked from the nose of a girl who had been bathing in a river. The creature lives in the remote parts of the Upper Amazon and has a "particularly unpleasant habit of infesting humans", the scientists say. Studies also revealed that it had "a preference for living up noses". The research published their findings in the online scientific journal PLoS One. Dr Renzo Arauco-Brown, from the School of Medicine at the Universidad Peruana Cayetano Heredia in Lima, was the medical doctor who extracted the leech and sent it a zoologist in the US. The zoologist, Dr Mark Siddall, from the American Museum of Natural History in New York, was quick to recognise it as a new species. He said it had some very unusual features, including just one single jaw, eight very large teeth and extremely small genitalia. Dr Siddall then brought together a team of researchers who studied the leech's features and DNA. Anna Phillips, a graduate student affiliated with the museum, led the study. She said: "We think that Tyrannobdella rex is most closely related to another leech that gets into the mouths of livestock in Mexico. "The leech could feed on aquatic mammals, from their noses and mouths for example, where they could stay for weeks at a time." The DNA analysis also revealed "evolutionary relationships" between leeches that now inhabit distant regions. This suggested that a common ancestor of this group may have lived when the continents were pressed together into a single land mass or supercontinent called Pangaea. 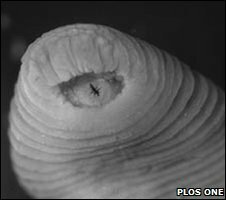 Dr Siddall explained: "The earliest species in this family of leeches no doubt shared an environment with dinosaurs about 200 million years ago. "Some ancestor of our T. rex may have been up that other T. rex's nose." Although around 600 to 700 species leeches have been described, scientists believe there could be as many as 10,000 species throughout the world in marine, terrestrial and fresh water environments.